Rice, powdered sunflower oil preparation (sunflower oil, glucose syrup, sodium caseinate, silicon dioxide), lactose, dehydrated mushroom, salt, wheat starch, hydrolysed vegetable protein, yeast extract, natural flavor, onion powder, dehydrated parsley, turmeric powder. 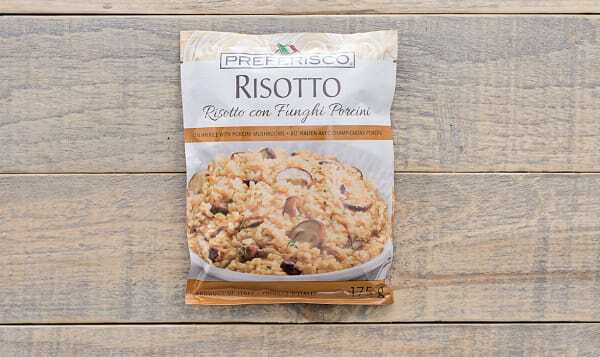 This risotto is ready in minutes and makes a great accompaniment to any meal! This product traveled 6 km to reach our warehouse. Bosa Foods was founded in 1957 by Augusto Bosa who recognized a need for traditional Italian food in the lower mainland. A pioneer of his time, in the 1940’s Augusto Bosa began to import Italian specialty food into Powell River where there were a large number of Italian immigrants working in the mines and the lumber and pulp mills. Sourcing and bringing the finest and sometimes most obscure traditional Italian products to the Italian community gave the community a feeling of home. In 1957, Augusto Bosa then brought his business to Vancouver, pledging to continue to import traditional Italian specialty food products and service the growing Italian community in Vancouver. Bosa Foods continues the work of Augusto Bosa today, servicing a larger demographic, but committed to the same purpose – to bring true Italian cuisine to your table. In 2006, the third generation of the family built a modern 54,000 square foot distribution centre and flagship retail store as the need for space surpassed what the original location on Victoria Drive could provide. With over 7,000 SKU’s of specialty products, it is possible to find nearly any traditional Italian or Mediterranean food product at Bosa Foods. While holding the retail customer dear, Bosa Foods also proudly services some of the best fine dining restaurants, single and multi-unit retailers, manufacturers, and foodservice operations in North America.